In c there are six type of memory model. And select any memory model and click OK button. (1) Memory model decides the default type of pointer in C.
Code: A pointer to function is called code. Data: A pointer to variable is called data. Output: Depends upon memory model. Explanation: If memory model is TINY, SMALL or MEDIUM then default pointer will near and output will be 2 other wise output will be 4. Explanation: fun is pointer to function. 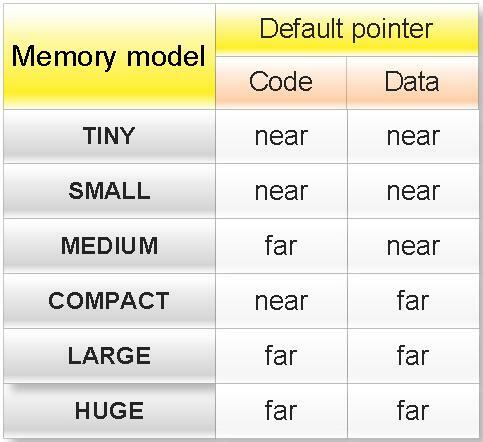 If memory model is TINY, SMALL or COMPACT then default pointer will near and output will be 2 other wise output will be 4. Output: 2, Depend upon memory model. Explanation: p is near pointer while type of pointer q will depend what is default type of pointer. Output: 4, Depend upon memory model. Explanation: p is huge pointer while type of pointer *p will depend what is default type of pointer. (5)Write a c program to find the memory model of you computer? (2) Memory models decide the default size of segment.